Sir John Frechville Ramsden [1877-1958], 6th Bart., Bulstrode, Gerrards Cross, Buckinghamshire; (sale, Christie's, London, 11 July 1930, no. 23, as Joos van Cleve); sold 1930 to (Hermann Ball, Berlin); (Schaeffer Gallery, Berlin, by 1930); Adolph Caspar Miller, Washington, by 1937; bequest 1952 to NGA. This is known from an annotated copy of the Christie's sale catalogue in the NGA curatorial files. Information about art dealer Hermann Ball and his firm provided by Mrs. H. S. Schaeffer. Mrs. H. S. Schaeffer wrote on 6 June 1983, "It is very possible that Alex Ball [son of gallery founder Hermann] bought the paintings in London and gave them to my husband for sale, as they did not have many paintings at this time. I know that Mr. and Mrs. Miller bought them directly from us." Letter in NGA curatorial files. Washington, Phillips Memorial Gallery, 1937, Paintings and Sculpture Owned in Washington, no. 2 (as Ambrosius Benson). Paintings and Sculpture Owned in Washington, Phillips Memorial Gallery, Washington, 1937, no. 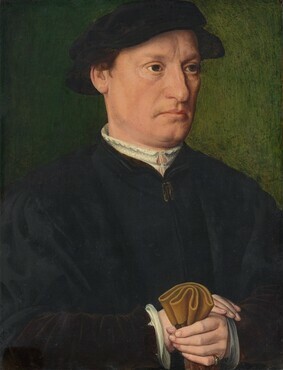 2, as Ambrosius Benson. The painting is generally in good condition. There are tiny, inpainted losses scattered throughout, and an area of abrasion in the left shoulder has been inpainted. Over the background is a layer of dark green, pigmented varnish. It is possible that the original background was lighter in color but suffered from discoloration (yellowing) or some other damage and was restored. This restoration was partially removed and the background restored to its present appearance. Examination with infrared and infrared reflectography reveals underdrawing in the face and hands. The gloves were painted over the left hand and the position of the hand then lowered. Surface dirt was removed and minor treatment administered in 1957. Reverse: There are indications that the present design layer is not original. Small losses appear to lie under the lower banderole at the right, the black background seems to lie over cracks in a lower layer of blue, and the outlines of leaves lie over cracks and other damages. However, the present design layer does not look modern and may be a reinforcement of the original design. 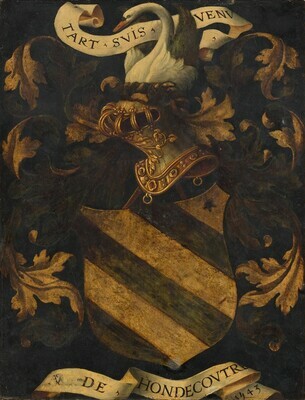 There appear to be several layers of varnish covering the surface and these have altered the colors of the blazon.